U.S. brokerage sales volume of 1,858 boats in November was in line with recent years — lower by 11 boats, or 1 percent, compared with the previous November, but ahead of the five-year average for the month by 34 boats. The total value of sales was 5 percent below the previous year, at $256.8 million, but that was principally attributable to sales of lower-priced superyachts. According to YachtWorld member brokerages reporting in SoldBoats, their proprietary database, the rest of the market finished the month up $6 million, a 3 percent gain. Slower sales of boats smaller than 26 feet caused the slight drop in sales volume, compared with the same month last year. In that segment 449 boats were sold, 29 fewer than in the previous November. Sales of boats 46 to 55 feet were also lower, down by seven, as 119 were sold. Sales increased 2 percent in the high-volume size ranges of 26 to 35 feet and 36 to 45 feet as 712 and 493 boats were sold, respectively. The average value of 26- to 45-foot boats that sold increased 3 to 4 percent. Sales through November totaled 27,884 boats, 2 percent below 2015 volume. The total price paid was $3.46 billion, a marginal increase from $3.45 billion last year. In our last report we looked at YachtWorld brokerage sales of the most popular class of boats — power cruisers. This month our focus is the No. 2 market, center consoles. 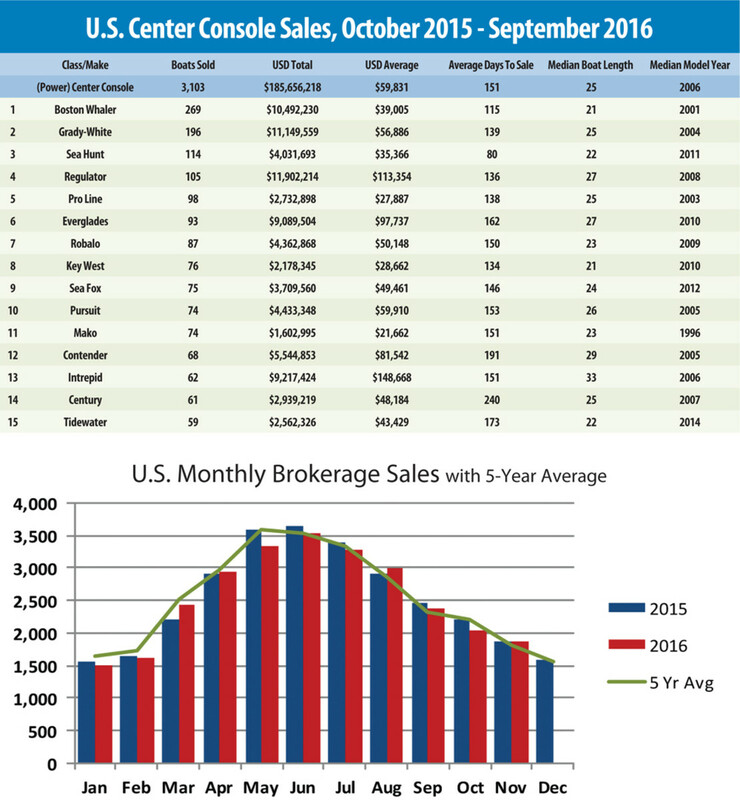 The figures in the adjacent table reflect sales from October 2015 through September of this year. There were 3,103 center-console boats sold during the period, about 500 less than the number of power cruisers sold. The median length sold was 25 feet with a model year of 2006, and the average sale price was a shade under $60,000. You don’t get to be the top-selling brand in a brokerage class without longevity, and that’s certainly an attribute of the No. 1 brand, Boston Whaler, which is pushing 60. Nearly 9 percent of center consoles sold in this period were Whalers — 269 boats — with a median length of 21 feet and a median model year of 2001. Those numbers demonstrate that the company has built plenty of center consoles – in this centuryas well as the last. Grady-White ranks a strong No. 2, with 196 boats sold. The median length of Gradys sold during the period was the same as the class as a whole, 25 feet, and the model year and average price were not far behind the rest of the market. Among brands in the top 15, the Sea Hunt models sold (No. 3, 114 boats) were the newest (2011 median model year) and the only brand to sell, on average, less than 100 days from listing. At No. 4, brokers sold 105 boats by Regulator, which among the top 15 brands delivered the second-highest average price, behind Intrepid. The two brands averaged more than $100,000 a sale. The median length of Regulators sold was 27 feet, compared with 33 for Intrepid.